Okay, so here’s part of the story, something that I had been keeping quiet here for very paranoid reasons – wanting to make sure we didn’t have any problems (back story here: MC worked with someone that lost a baby somewhere around 8 months)… so, yes, the hints that have been dropped over the past couple of weeks lead to this: MC and I now have an expansion pack, a baby boy. Now here’s the rest of the story, so he can know some of it in the future. Back in July, I came into the bedroom while MC was in the bathroom with the door closed. I started folding the basket of laundry that I was carrying, when all of a sudden she shouted, “Oh my God.” there was a pause, then she repeated it another half dozen times. I burst into the bathroom, where she was standing by the window. I saw her expression on her face and she was staring back at the counter. Lying there on the counter was the positive test. By the time she went to the OB office the next week, she had a total of eight positives. Not long after that incident, I was in Greensboro for the Orson Scott Card writing workshop, and we were given 15 minutes to do a quick scene free-write. The first thing that came to mind was the above moment. We were given an expected delivery date of 17 April. Soon after we got back from Boston last month, MC went to the OB office and was taken out of work for elevated blood pressure issues. “We want to keep you pregnant as long as possible,” to OB said. “We want you to get to at least 34 weeks, and ideally at least 37 weeks.” Two weeks later, her water broke. The next morning, on the day that marked 34 weeks, he came into the world. 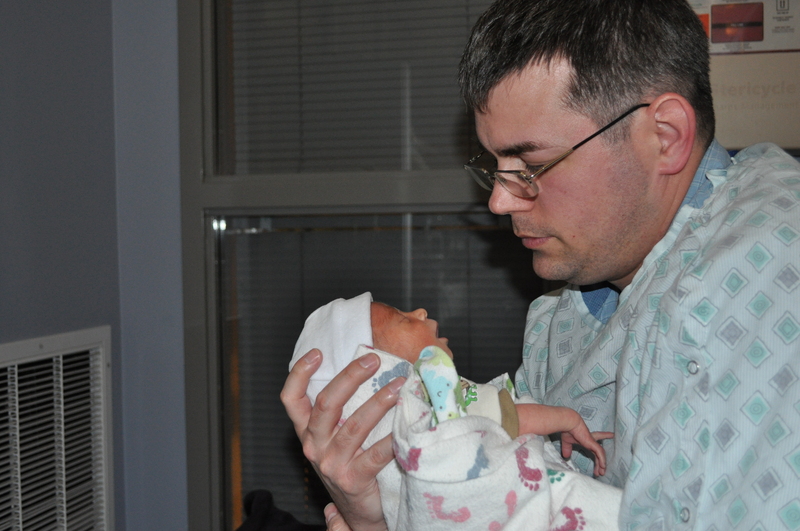 He was taken to the NICU (Neonatal ICU), and was placed on a CPAP. By that afternoon, he was off of it. After initially being told that he could bend up staying in the hospital “until what should have been his due date.” A week later, he was moved to the Convalescent Nursery. A few days after that, he came home. So earlier today (20 March), he turned two weeks old. Life has gotten a lot more interesting, as anyone with kids can attest to, but it’s a good kind of interesting. It’s the start of a wonderful journey, and something that I am likely to post about in the future.